your accessibility efforts and spot the most at-risk areas. Websites and systems are constantly changing and growing—which means your level of compliance is likely changing too. 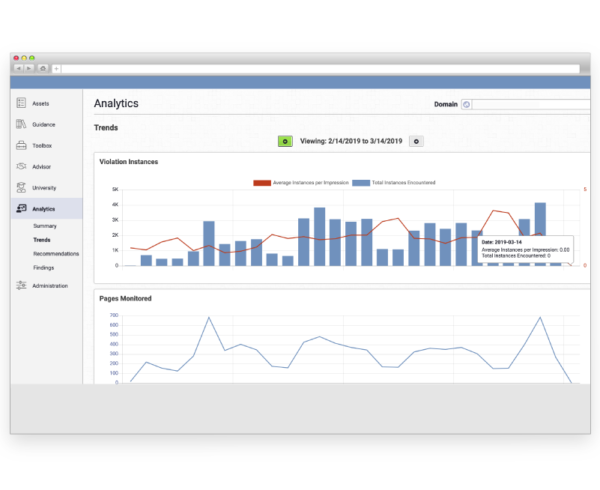 Access Analytics is a practical monitoring solution which blankets your site and makes it easy to detect new issues that emerge and understand patterns or trends. 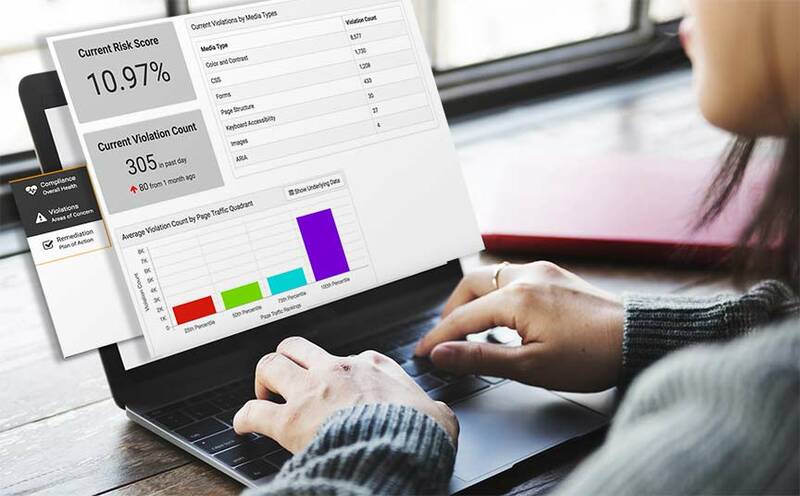 The dashboards offer clean, understandable summaries which make communicating results to executives, regulatory authorities, and other stakeholders simple and straightforward. It’s the perfect way to guide an accessibility journey—and we should know, because we use it ourselves. 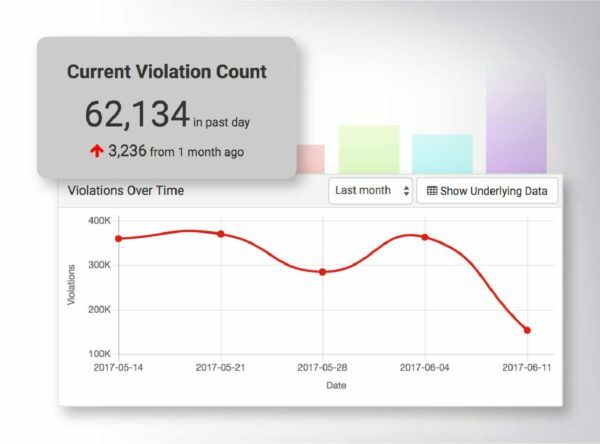 Access Analytics tests for common and noticeable violations by flagging issues encountered in real time by actual visitors. Simple, manageable views allow users to quickly gauge their current risk exposure so they can easily identify root causes and take direct action through the recommended next steps outlined right in the dashboards. Get ongoing clarity into the accessibility of your digital properties​ so you can catch things between scheduled audits​ and address concerns right away. Measure important metrics to better inform your team’s efforts​, show progress, and make sure new updates don’t erode previous work. Increase your ROI​: Access Analytics lets you easily zero in on the critical areas so you can save precious time and plan more efficiently.​ Get the most out of manually-intensive efforts by focusing on high-traffic pages, sections with known issues, or any regressing areas. Users have a convenient ‘portfolio view’ of assets, so they can easily compare and track any changes in accessibility across different domains. Monitoring the compliance health of different assets and properties across the organization enables more effective accessibility governance. 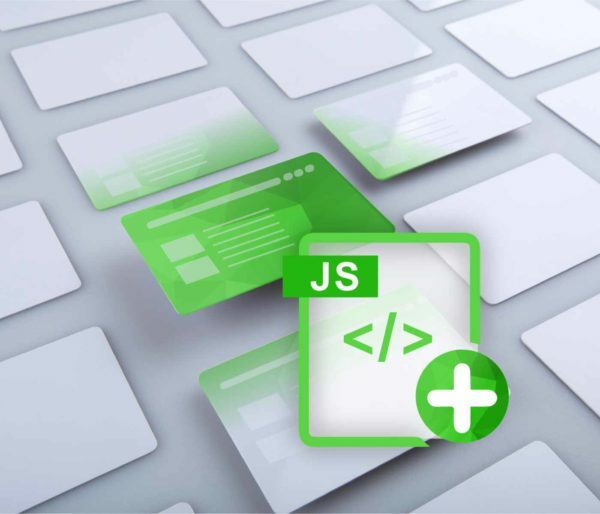 Since each update or change to content can introduce new issues, it’s too easy for obstacles to slip in unnoticed and threaten the user experience. As organizations everywhere strive to increase their content output, Access Analytics ensures accessibility is tracked and measured alongside those efforts.